Analysts said this was a strong sign that the Fed would cut interest rates again when it meets later this month. David Resler, chief economist at Nomura Securities International, said Mr Bernanke's remarks came as little surprise. "It is probably likely to solidify expectations... that the Fed will (cut rates by) 50 basis points... now more people will think that way," he said. US stocks were boosted by the news as investors were buoyed by the prospect of future interest rate cuts. The Dow Jones industrial average added 117.78 points, or 0.92%, at 12,853.09. Standard & Poor's 500 Index added 0.79% and Nasdaq rose 0.56%. 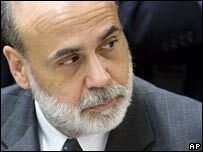 Mr Bernanke said recent information suggested "that the baseline for real activity in 2008 has worsened and the downside risks to growth have become more pronounced". The US is facing the twin threats of how to tackle a slowing housing market and lower consumer spending while at the same time addressing inflation as oil and food prices rise. In particular, Mr Bernanke highlighted the impact the slowing housing market, and specifically the sub-prime mortgage crisis, was having on the wider economy. With banks having to write off billions of dollars of investments linked to sub-prime debt - loans taken out by people with bad or little credit histories - this has made them reluctant to lend, limiting the availability of credit, Mr Bernanke explained. He added that the financial situation "remains fragile, and many markets remain impaired", saying that much uncertainty remained about the exposure of major banks to the credit crisis. But he said that while banks had become more restrictive in their lending, it was in their best interest to find a systematic way to restructure loans. "This is not a situation that can be dealt with one mortgage at a time," he said. As well as underlining sub-prime problems, the Fed boss cited higher oil prices, lower equity prices as factors that could further dent consumer spending. During his speech at a Women in Housing and Finance lunch, he also said that if the labour market continued to worsen, this could further add strain to the economy. He singled out recent poor employment data that showed only 18,000 jobs were created in December. "Should the labour market deteriorate, the risks to consumer spending would rise," he said. But when asked if he was concerned about a possible recession he said: "The Federal Reserve is not currently forecasting a recession." However on Thursday, the Institute of International Finance (IIF) said it predicted the US economy would expand by 2.3% in 2008, which implied that a recession "could be avoided". This figure exceeds both the World Bank and IMF's maximum forecasts of 1.9% growth for the year.